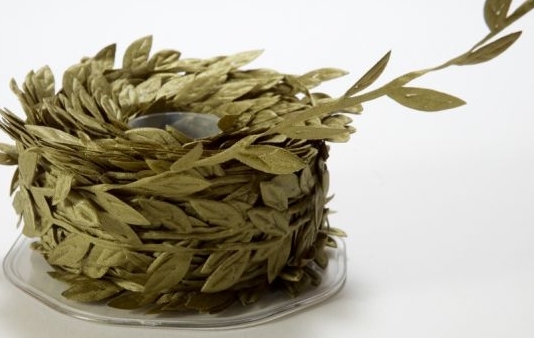 May Arts Leaf Vine Ribbon in Olive Green. This beautifully decorative leaf ribbon can be used to decorate just about any piece of artwork. This lovely ribbon has an abundance of mini leaves that each measure 3/4 inch and actually has veins on the leaves. It is made of polyester and can be easily inked if desired. I've seen this used as a stem with a Prima mulberry flower at the top. Use a paper flower that has been punched or a stamped flower and place it at the top of the ribbon. Use it as a border, or you can edge the side of your ATC, greeting card or scrapbook page. You can use it for wrapping gifts, and just about anything else you can think of. Sold by the yard at $.81/yd. Creative Impressions Grosgrain Happy Birthday Ribbon by the Yd. Creative Impressions Grosgrain I Love You Ribbon by the Yd. Creative Impressions Grosgrain Party Time Ribbon by the Yd. Baker's Twine Cording Red, Olive and White Striped - 5 yds. Baker's Twine Cording Green and White Striped - 5 yds.